before Geoff gather’s Lennon and Tony’s thoughts on achievements. 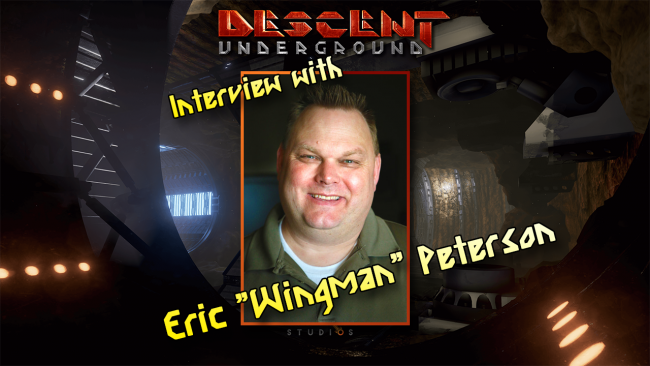 The Chiv is out sick again this week so no Sim Pod, but fear not, we have something even better, as we bring you our interview with Eric ‘Wingman’ Peterson, the Director of Fun at Descendant Studios; and finally we tune into the Feedback Loop and let you join in on the conversation. Achievements! Do they increase the fun and help you find new and exciting ways to play or is too much instant gratification a bad thing? I for one dont worrry too much about achievements. And thanks very much to the Wondrous Wingman for coming on, looking forward to playing the new Descent, loved the original, just have to get myself out of the Wasteland. – Does a fish know he’s wet? – Is time a tangible thing? – Is the universe infinite or finite? – Since Geoff is immortal, does that mean he’s omniscient as well? – Can Star Citizen and Elite Dangerous exist in the same universe? – Does “he who shall not be named” make video games? – Is Chiv the most valuable member of Guard Frequency? – If a meteor explodes in the middle of the ocean, and no one is around to hear it, does it make a sound? Think of this as my small, yet well meant contribution to the show…oh, and excellent interview with Wingman….oh, and good show too….oh and Chiv, get well soon…take some more vitamin C or something. Minerals, vitamin C, D, B#, and more! Thanks! Another great episode guys. On the subject of achievements, I think like lots of things, its good in moderation. But too much can be a bad thing. I agree that when you’re being handed a dozen achievements purely because you’ve been through a tutorial, then the concept of achievements is lost, and they become nothing more than a bunch of mundane milestone markers. Also fantastic to hear from Wingman. I’ve caught a few of his Descent WMH shows, and they remind me of the original Star Citizen WMH. I miss those. It was also good to hear that there’s no ill feelings between him and CR/CIG. I really wish him and his team all the best, and hope they do spectacularly well.